It turned out to be a restaurant and banquet facility in Monastier called “Ristorante dei Contorni". He’d taken them in late December of 2004 while visiting the place; it’s just a bit north from Venice in Treviso. 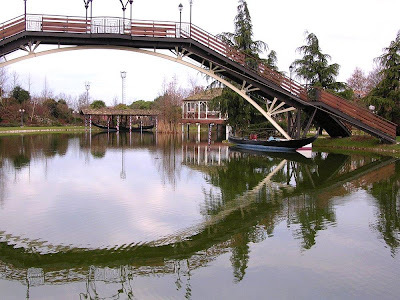 They have two gondolas, which float comfortably on their own little lake, some interesting structures that incorporate striped poles, and a very dramatic bridge. I imagine the bridge must be difficult to climb for brides in wedding dresses, but I'm guessing it's got a great view. Good job Nereo - you really got me with this one. 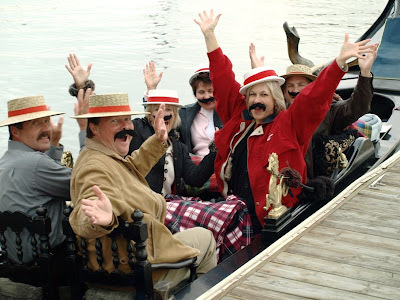 Boy, what a surprise it was last night when I pulled up to the Villa Nova docks to pick up my passengers...and they all came out wearing gondoliers hats and moustaches. These were of the party supply store variety, of course, but they sure made a spectacle for all of the dining room guests to laugh and carry on about. 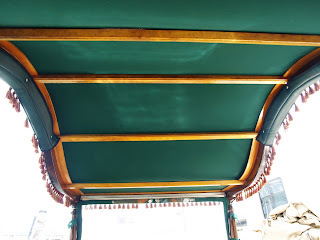 Six passengers in a Venetian gondola requires a gondolier to work a bit harder in balancing and such, but when they come on board hooting and hollering, wearing hats and moustaches...well, that's different. Let's just say that next year at this time, I probably won't remember my other cruises from last night, but the memories of this one will still be fresh. This group was a blast to have on the boat, and I wouldn't trade the experience if I could. I would, however, prefer to not wear one of those moustaches - they had prongs that clipped inside your nose! Ughhh! Well, Matt proved to be one of the best I've seen in a long time at picking up the strokes and using them in the right measure. Today was another perfectly beautiful So. Cal. day. We ventured into the canals this time. Matt had the opportunity to fight with the wind a bit in close quarters, and towards the end, even showed some understanding of sotomorso", which is not easy for new students. Yeah, that's me "sucking in my gut" right before the photo was taken. 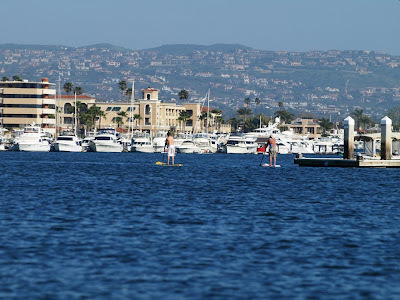 A good stroke doesn't always need to involve the whole "paddle surface". 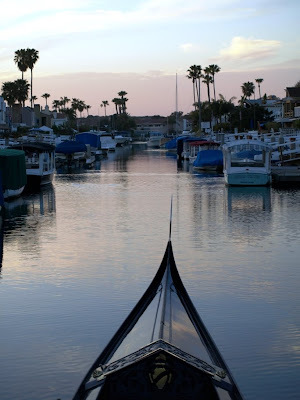 By now my fascination with the gondolas of Venice, California is probably obvious. There aren't any there now, but in the dawn of the 20th century, the place must have been unreal. 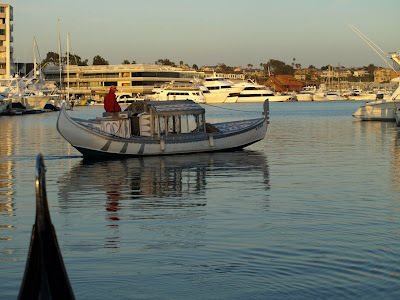 The fact that gondolas and their gondoliers were shipped from Italy by steamship to California is impressive - it must have been a long ride, especially back then. thirty-six gondolas and their gondoliers. 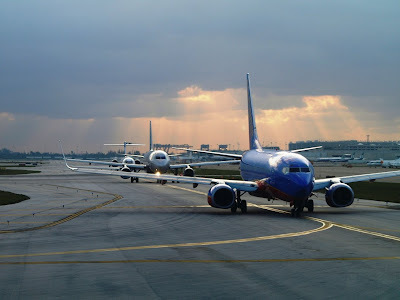 Whether they were all on one ship or came on different ones, bringing over a fleet of that size was quite an endeavor. 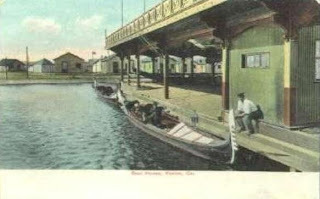 Here we have a postcard image with two gondolas side-tied at the boathouse. It's hard to tell, but there may be a third gondola in the background under a roof or awning; it looks like it's been pulled out of the water for maintenance. 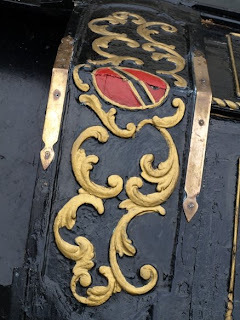 Now take a look at the deck of the boat in the foreground - it has the structural elements typical of gondolas of the era, with their diagonal trim running from the rails up to the center spire. And then there's the white; I don't know this for sure, but I'm pretty confident that these gondolas didn't come from Venezia with white paint between those diagonal trim pieces. 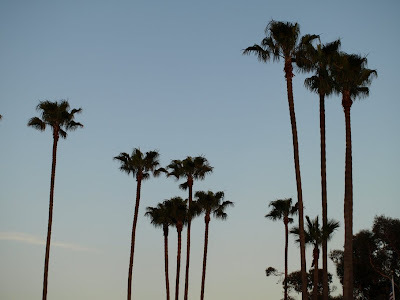 I've encountered several postcard images from Venice, California with white or tan decks. Were the decks painted that way to keep them cool in the sun? Was it done in the interest of having a clean look? After all, nothing shows dirt like a black boat. Or was it "gondoliers gone wild" with Venetians taking pleasure in slapping paint in colors other than the black that Venetian law required? I had a great conversation today with Tyson from Sunset Gondola. He and Tim just got back from Venice, and by all accounts, had more fun than anyone should be allowed to have. 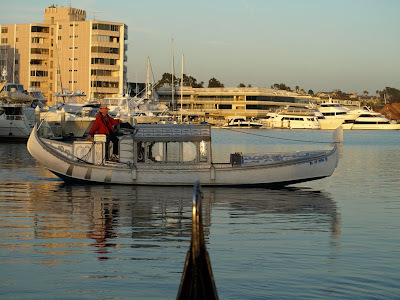 The guys at Sunset have one of the coolest boats in their fleet: a pupparin. The pupparin (also referred to by some as a pupparino) is a type of sandolo. The sandolo hull design is a simple and elegant design, consisting of three curved "sheets" of wood and a small transom piece. 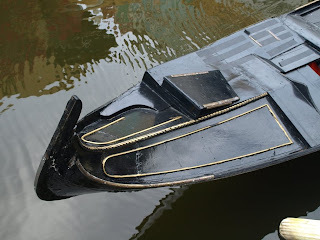 They are seaworthy, easy to maintain, and arguably easier to build than a gondola, which has numerous complex curves in her design. 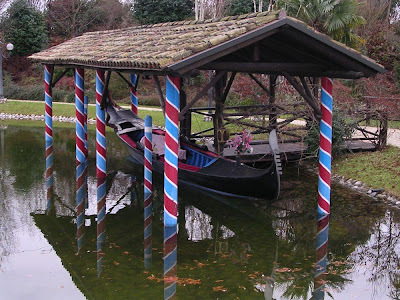 The pupparin has been described as a gondola-sandolo hybrid because she has characteristics of both boats. 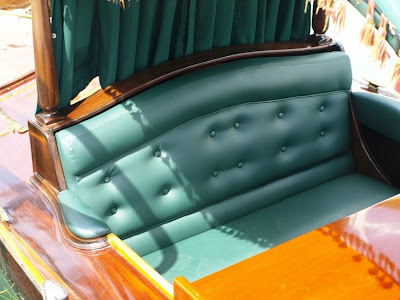 She is also described by some as a "transition boat" because young men are usually the ones racing her; guys who are typically on their way to becoming gondoliers. 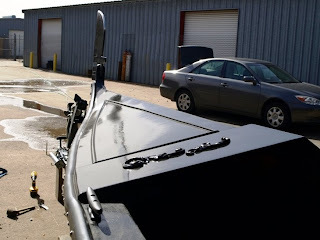 There are numerous other opinions associated with this unique boat, but my commentary would be incomplete without mentioning the lines of the boat. The pupparin may be the most graceful of all boats in the sandolo family. As far as I know, the pupparin at Sunset Gondola is one of only two in North America. I took some shots of her last time I was on their docks. 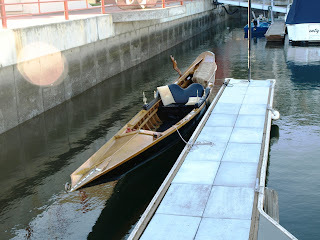 This boat was built in 1982 by Roberto dei Rossi in Squero San Trovaso. 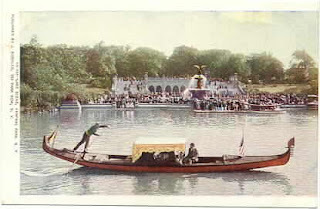 Notice the seating and surrounding parecio resemble those of a gondola. 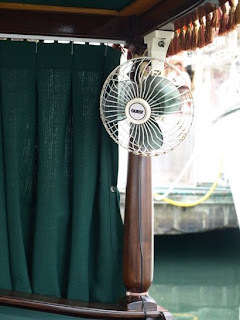 In addition, the floorboards, forcola and gondolier's deck have strong similarities too. Here's a close-up of the unique ferro piece. The pupparin is shorter in length and has less windage so she is more maneuverable and easier to row in windy conditions. 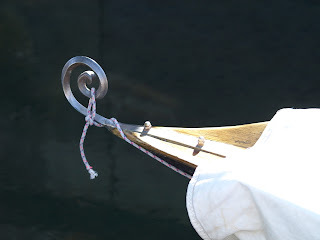 The pupparin is also one of the Venetian designs that are asymmetric. Looking down the center line, you can see her built-in curvature. I suppose it's no secret that Nereo Zane is one of my favorite photographers. Here, he has captured Piazza San Marco and her distinctive campanile from a unique angle. 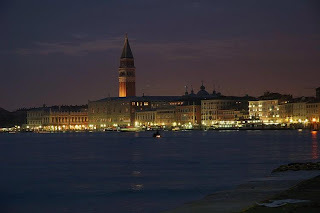 This photo was shot from the fondamenta in Castello - I believe he was next to the Giardini Pubblici. Kevin, me and Patty in front of the Naples gondola. 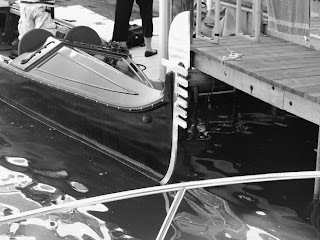 I spent some time yesterday training Patty at the gondola operation in Naples, went through some last-minute things with Kevin, and was finished, for the time being in Naples. Today we drove back across the peninsula by way of the Everglades, and tomorrow we'll board a jet for California. I've had a wonderful time out here, and over the years Florida has become a very special place in my heart. Special, but hot and sticky. I told my wife todaythat we couldn't set up residence here unless I had a pair of "hermetically sealed, air conditioned underwear". So tomorrow it's back to California and perect humidity. 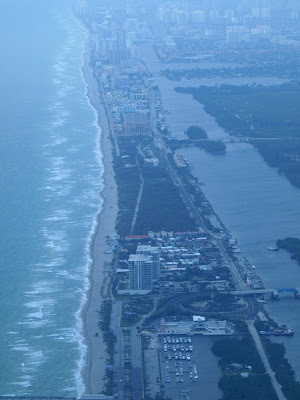 This morning we made our way from Miami, across the peninsula that is the state of Florida, and arrived in Naples. What a beautiful place. I've spent a fair amount of time on the west coast of Florida, and this has quickly become one of my favorte spots. We made our way to The Village, an upscale shopping and dining location to train and visit with some folks I sold a gondola to recently. My trainee today was a local captain named Kevin, who took to it handily; his boating and canoe skills giving him a bit of a boost in the training process. 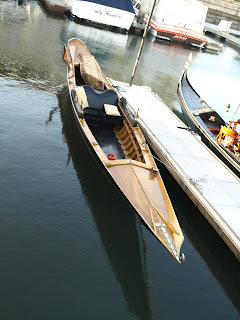 The remo and forcola are Venice-built. I'm not sure of the remo, but I suspect it was carved by Paolo Brandolisio. The forcola is brand new, and came from Franco Furlanetto. 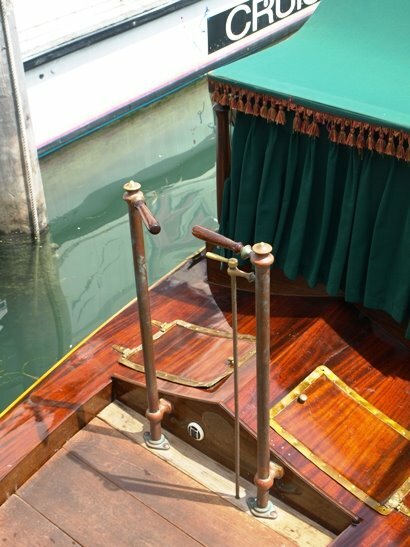 The gondola is not Venice-built, but rather, a 32' fiberglass version, asymmetric, with an optional motor mounted in the front. 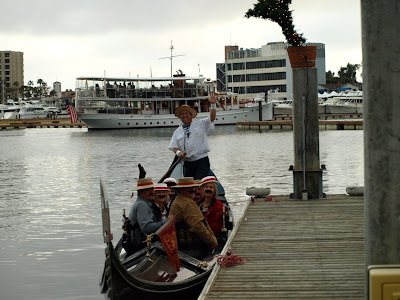 My goal, however, is to train gondoliers to do everything without the motor, because then they do not depend on it. 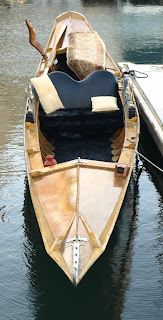 Furthermore, I know that most gondoliers who operate boats like this, end up rowing without the motor almost all the time. The gondola has a rather pronounced asymmetry. 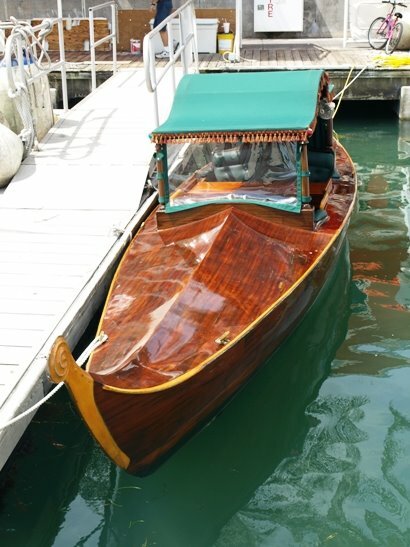 Her designer, Jack Fesenmeyer was a big fan of the off-center design of Venetian boats, and worked it into his molds, which we now own and use to produce these gondolas. I arrived today at Stork's Cafe in Ft. Lauderdale, hoping to row. It had been almost two weeks since I'd been rowing and I needed a workout. 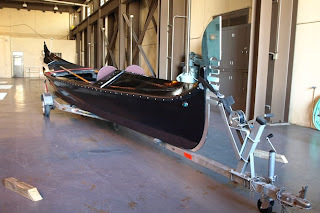 I met gondola operator Pierre Meunier, he showed me around, and then we dug through a storage closet to find an oar. Stork's Cafe is immaculate; the place is a local favorite, and for good reason. 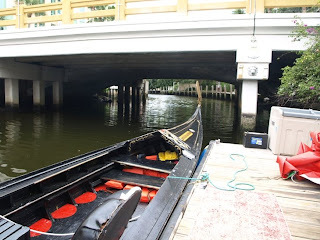 Located on Las Olas Blvd, Stork's is next to a tiny canal called the Himmarshee Canal, and passersby all stop on the bridge and look down at the gondola. It's a great location, especially when you consider that Las Olas has been described as the Rodeo Drive of the area. 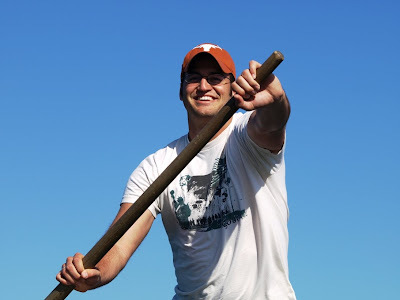 As we were digging through the storage area for an oar, I got to know Pierre. For starters, he's a very patient guy: here's some crazy gondolier who just shows up from California and says "hey, I'd like to take your boat out", and then, even though the gondola is usually propelled with an electric motor, the visiting gondolier insists on rowing, and then talks his host into doing a full inventory of the storage closet in search of an oar. Through it all, Pierre was patient and personable. 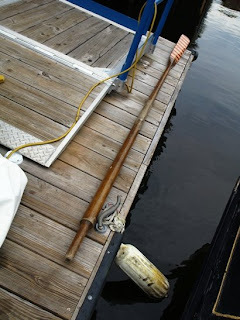 We found an oar, way in the back, and then went about the business of extracting it. As I talked with Pierre, I learned that he is originally from Nice, France, but has been here in the US for twenty-eight years. 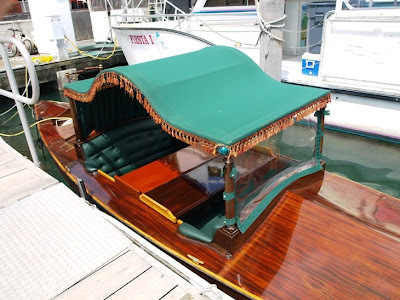 He is a licensed captain with a 100 ton ticket, and has operated several types of boats in the waters here, including charter boats, water taxis and even amphibious "duck" boats. He's a funny guy with lots of great stories to share. 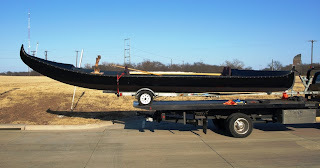 Once we removed the oar from storage, I realized it was a lifeboat oar, but was still determined to row. 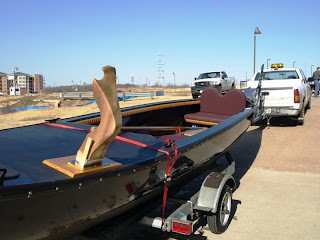 So we uncovered the gondola which was at dock there. and then there's the gondola I was on today. 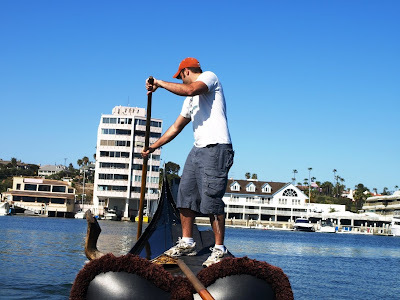 Today's gondola is very special to me because for many years it belonged to my friend Norm Warsinske in Seattle, Washington where he kept it in various places. 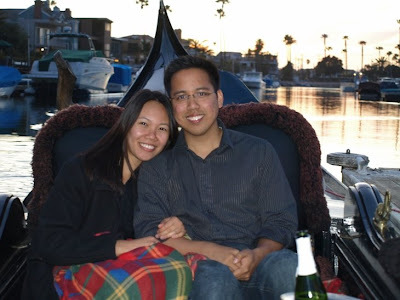 I first stepped on the boat about ten years ago while visiting him on Lake Washington. 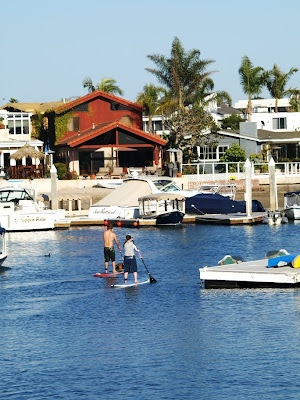 A few years ago, Norm sold the gondola to someone in Miami, who then sold the boat to Mike Novack. If you're just joining us here, folks, Mike is a gondola operator in New Jersey, who recently took over operations in front of Stork's Cafe as well. 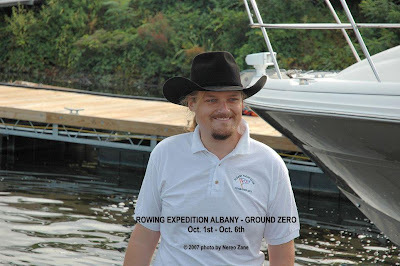 Mike is also the Vice President of the Gondola Society of America, and one of the biggest gondola fanatics I know. Mike and Pierre took over after the original operator, Angelino Sandri had moved on. 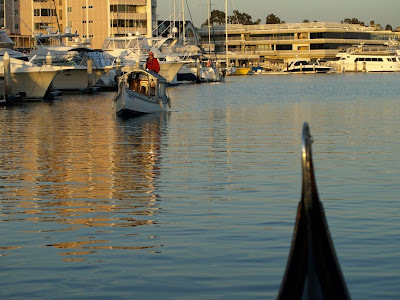 Angelino is one of the best gondoliers I know, so I was really looking forward to rowing at Stork's, and experiencing firsthand, the area I'd heard so much about. The waterways were pristine, looking in any direction I saw beautiful views, complete with lush greenery, banyan trees, palms of many kinds, and gorgeous homes. 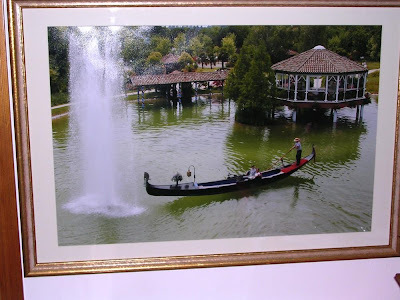 After uncovering the gondola, I noticed that a well had been installed with a trolling motor reaching down through and into the water. As Pierre and I set out from Stork's, we went down the Himmarshee Canal, a slow and easy piece of water, and then jumped into the fast-moving New River. The New River is a busy through-way for yachts and vessels of all types that travel to and from shipyards, many of them being towed. Also present on this river were tour boats and water taxis. 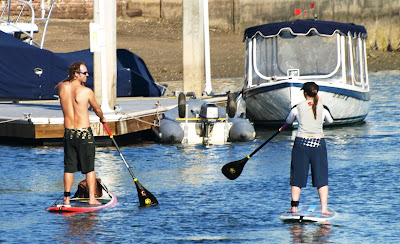 As if boat traffic weren't enough, the New River has a strong current, which was moving at about five knots today. 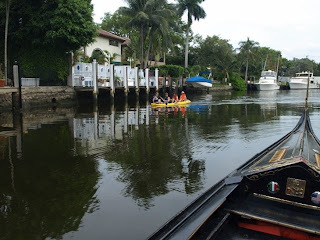 As we headed down the New River and turned into the Tarpon River, we watched two large vessels, a luxury yacht and a high speed motorized catamaran, trying to navigate one of the tight turns as they powered upriver. Heading up the Tarpon River, the current was moving against me at about one knot, and the water was as smooth as glass. Pierre told me about how the river had been used so many decades ago in a number of Tarzan films starring Johnny Weissmuller - one of the most popular actors to portray the ape man of the jungle. 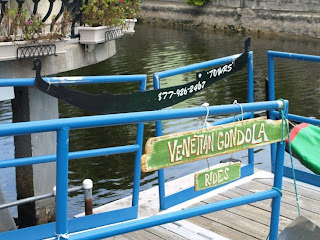 I rowed up past the 9th Street bridge and turned around where most of the passenger gondola cruises do. Going back down with the current was easy and relaxing on the Tarpon, which gave me time to prepare for the New River. 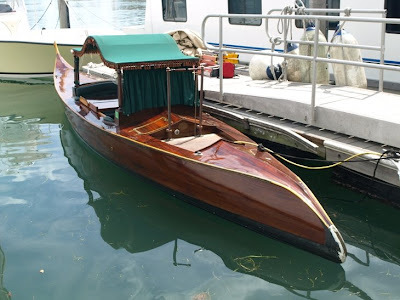 This gondola is solid, with all the charm you would expect from a Venice-built boat, but she's got some extra weight due to the well, motor, and the seven batteries on board. Rowing it all up the river was a great challenge, and turned out to be just the workout I'd been looking for. Once we re-entered the Himmarshee Canal, it was calm again and I took a moment to wave to a huge riverboat which was giving a tour on the New River. At that point, Pierre told me that he'd been waiting the whole time for me to ask him to turn on the motor. It was a great row and I look forward to doing it again the next time I'm in town. 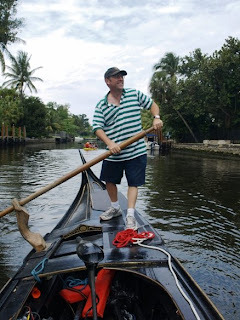 If you have the chance to visit Ft. Lauderdale, be sure to stop by Stork's Cafe and arrange to meet with Pierre; he's a gondola fanatic, great guy, and the kind of guy I like to see in the gondola business.